Happy Mother’s Day! Well, the last hour-ish of Mother’s Day. This blog is all about honouring our nurturers and female supporters, so every day is Mother’s Day. (cor-ny) Mother’s Day also marks a clear start of summer. Or it should. Today there was HAIL in Toronto. Plus, it was very very cold. It sure ‘aint fair for a girl to be ready with her sundresses and then all of a sudden she is back to dressing like a boy. 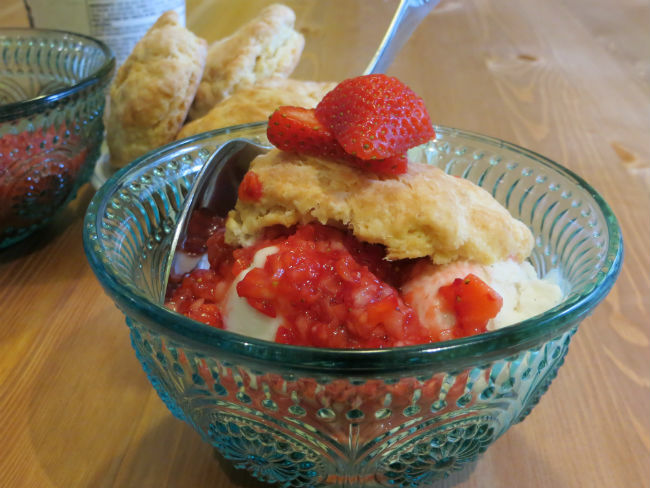 But, to keep my head in the sand about the weather, I’m going to put my head into a bowl of this strawberry shortcake. Technically, this is supposed to be full of whipped cream but I’ve never been a big fan. Weird, I know. So, I swapped it out for a big ol’ scoop of ice cream. Give it a go while you cook your veggie burgers on the stove top and pretend it is BBQ season by now. 1 pint of vanilla ice cream. Mix together the vinegar and the soy milk. Set aside for 15 minutes to curdle. This will stand in for the buttermilk in the original recipe. In a large bowl, stir together the dry ingredients. Using a pastry blender or 2 knives cut in the butter until the mixture resembles coarse crumbs. Add curdled soy milk all at once, stirring with a fork to make soft slightly sticky dough. Turn the dough out onto a lightly floured surface and knead gently 10 times. Pat the dough into a 3/4 inch thick round. Using 2 1/2 inch cutter (or a juice glass like I did), cut out rounds. Place them onto an ungreased baking sheet. Gather up the scraps, press out again and cut out more circles until the dough is used up. Bake for 12 – 15 minutes. Meanwhile, prepare the strawberries by cutting off the leaves, slicing them and then chopping them in a small food processor along with the sugar. Only 4 or 5 pulses. Split the biscuits in half through the middle. Lay the bottom half into the bottom of a bowl. Layer with a scoop of ice cream, the mashed strawberries, the top half of the biscuit and then a couple slices of fresh strawberries. Then, enjoy the summer!